Hilton Hua Hin Resort & Spa is located right on the beach, so close to the centre of this coastal town, everything you want is within easy reach. The town of Hua Hin is also the seat of His Majesty the King of Thailand's Summer Palace, and because Hua Hin is in the presence of a King, it means this resort is a quieter, more gentle place. Picture yourself strolling through the winding streets, locals calling friendly greetings as they pass. Looking down over to the bay you can see the empty fishing boats bobbing idly in the midday sun. Not only is Hua Hin a family destination, it is also a spa destination and has six world-class golf courses just minutes from the resort. Find time to indulge in the ultimate spa packages with full body treatments, aromatherapy and reflexology. Then visit the stunning Pa La-u Waterfall or maybe you'll explore the Butterfly Garden. But whatever you do, you must dine at the rooftop restaurant on the 17th floor with its breathtaking views of the Gulf of Siam. 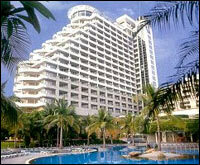 Bay room : 42 square metres, Sea-view room with large balcony overlooking the Gulf of Thailand. Renovated in 2001 into a warm contemporary Thai Style with wooden floor. Choice of one king size bed or two queen size beds. Separate shower cubicle in bathroom. Room is equipped with hairdryer, mini-bar, large refrigerator, in-room safe, IDD telephone, bathroom telephone, air-conditioning, and flat screen cable TV (25 inch). Connecting rooms are mostly between one king size and two queen bedroom. 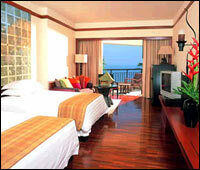 Gulf room: 60 square metres, Sea-view room with two large windows and balcony overlooking the Gulf of Thailand. Two Queen size beds. Large bathroom with daylight and separate shower cubicle. Changing room and comfortable living room area with sofa. Relaxing blue, green and yellow tones. Room is equipped with bathrobe, hairdryer, mini-bar, large refrigerator, in-room safe, IDD telephone, air-conditioning, cable TV (21 inch) and alarm clock which can be centrally controlled from bedside table. All Gulf rooms have a connecting door with a two queen beds Bay room. 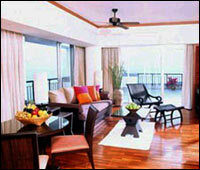 Pacific Suite : One bedroom, 80 square metre front sea-view suite with balcony overlooking the Gulf of Thailand. 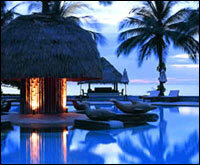 Renovated in Summer 2001 in warm contemporary Thai Style with wooden floor. King size bed, separate living room with dining area, table for four persons. Bathroom with separate shower cubicle. Suite is equipped with bathrobe, yukata, hairdryer, mini-bar, refrigerator, in-room safe, IDD telephone, bathroom telephone, air-conditioning, 2 flat screen cable TVs (25&29 inch). Available with connecting door to Bay room. Ayutthaya Suite (Royal Wing) : One bedroom, 150 square metre front sea-view suite with large balcony overlooking the Gulf of Thailand. Decorated in relaxing blue, green and yellow tones. One entrance to the living room with bedroom on the side. King size bedroom with sofa, balcony, IDD telephone, in-room safe, mini-bar, refrigerator, vanity desk, hairdryer, bathrobe, yukata, air-conditioning, flat screen cable TV (25 inch) and alarm clock which can be centrally controlled from bedside table. Bathroom with jacuzzi, separate shower cubicle, bidet, scale and telephone. Spacious separate living room with wooden floor and balcony, sofa, cable TV (29 inch), mini-bar, refrigerator, dining area with table for 6, and pantry with refrigerator and pass. Separate washroom at the entrance. Sukhothai Suite (Royal Wing): Two bedrooms, 200 square metre front sea-view suite with large balcony overlooking the Gulf of Thailand. Decorated in relaxing blue, green and yellow tones. One entrance to the living room with main bedroom on one side and second bedroom on the other side. Main bedroom with 1 King size bed, sofa, balcony, IDD telephone, in-room safe, mini-bar, refrigerator, vanity desk, hairdryer, changing room, bathrobe and yukata. Bathroom with jacuzzi, separate shower cubicle, bidet, scale and telephone. Second bedroom with 2 Queen size beds, sofa, balcony, vanity desk, hairdryer, bathrobe and yukata. Bathroom with separate shower cubicle, scale and telephone. Both bedrooms have air-conditioning, flat screen cable TV (25 inch) and alarm clock that can be centrally controlled from bedside table. Spacious separate living room with wooden floor and balcony, sofa, cable TV (29 inch), mini-bar, refrigerator, dining area with table for 6, and pantry with refrigerator and pass. Separate washroom at the entrance. Chakri Suite (Royal Wing) : A three bedroom 320 square metre duplex suite nestled atop the Royal Wing on the 3rd and 4th floor, with views of both the Gulf of Thailand and the small town of Hua Hin, its surroundings and its mountains. Can fit perfectly for three couples or very large families looking for their own private large space whilst being able to enjoy all facilities of the hotel. The entrance is on the living room with bay windows going up to the ceiling of the 2nd floor, shadowed by electric shutters. The living room has a pantry with fridge and separate access, and a pass, separate washroom, and a storage room, dining area for 8 people and large sitting area by the windows with two sofas and armchairs also seating up to 12 persons, together with a writing table. Full audio-visual equipment with: Sony Nicam Dual Stereo PIN P with 50 inch screen; Pioneer Laserdisc CLD 2710-K; Pioneer Audio Video Stereo Amplifier VSX-D9015; Sharp Hi Fi Multi System video H21E; Loudspeakers Reference KEF series 2x 200 Watts. Grand stairway accessing the second floor, leading to a large sitting area, with one main king bedroom on the left side and two bedrooms with two queen beds each on the right side. Access outside to an emergency stairway tower leading directly to the ground floor. Balconies are surrounding the second floor. Main King bedroom with balcony, sofa, cable TV (29 inch) IDD telephone, mini-bar and refrigerator. Vanity desk in separate large changing room with closets equipped with in-room safe, bathrobe and yukatas. The bathroom comes with a jacuzzi bath, opens to the bedroom and is extended into the bathroom by a seating area. Two wash basins, separate toilet with bidet, separate shower, telephone, bathroom scale and hairdryer. Second bedroom (2 queen beds) with cable TV (25 inch), mini-bar, refrigerator, IDD telephone, vanity desk with hairdryer, changing area and bathroom with telephone. Third bedroom (2 queen beds) with cable TV (21 inch), IDD telephone, bathroom with separate shower, telephone and scale. All three bedrooms have air-conditioning, cable TV, alarm clock and lights that can be controlled directly from the bedside table. Informal meeting coffee bar with internet access and newspapers in different languages from all over the world. 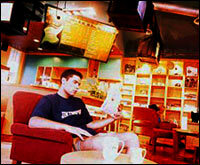 Choice of Cappuccinos, latt?s, milk shakes, frapp?s, as well as cakes, danish pastries, bagels and sandwiches. 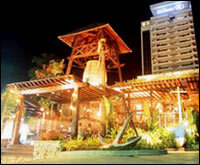 The first & only Beer House in Hua Hin, and a favourite night spot for both visitors and residents. Get the feeling of a fisherman house and taste the best freshly brewed beers in town: Sabai Sabai Wheat Ale, Dancing Monkey Lager, or Elephant Tusk Ale, as well as the largest selection of International beers in the Western Gulf of Thailand. 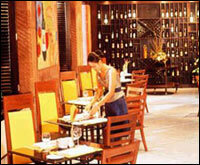 Extensive food menu comprising Western and Thai Beer House delicacies and snacks. Outside barbecue on the Terrasse every evening offering fresh seafood and succulent meats. "The Modify" 8-pieces pop-rock band and DJ "Snaz" get the place moving 6 days a week. Seashore Restaurant & Bar with service around the swimming pool. Features a sheltered terrasse with the foremost position of Hua Hin's coastline, offering relaxing moments enjoying the seabreeze whilst watching the typical fishing boats. Italian ice creams, tropical cocktail, sandwiches and healthy salads are just a swim away. Classical Cantonese Cuisine at the top of the hotel with stunning views of the Gulf of Thailand and Hua Hin surroundings. Located on the 17th floor. Main restaurant for breakfast, lunch, dinner. 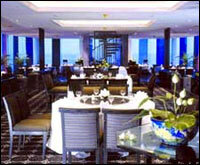 A la carte and buffet with special themed night. Features "Il Mercato" for Wood-fired pizzas and antipasti, "Ichi-ba", the first place in Hua Hin for sushi, sake and teppanyaki, "Talad Talay Sod", Thai home cuisine and seafood. The restaurant also had a terrasse overlooking the garden, swimming pool, and the sea.